Don't let the simplicity of weighted carries fool you. This movement has it all. See why you should pick up heavy weight and walk until your grip fails or your legs buckle! Many lifters resort to drastic measures to pair big, healthy shoulders with a crushing grip. Some follow outrageously complex training regimens or layer on high volume and various delt raise variations. What if I told you that building a big yoke and a mammoth grip is as simple as picking up weight and walking with it? Believe it. Loaded carry variations take grip strength, trap size, and delt growth to new levels. Loaded carries are simple. Pick up something heavy, hold on for dear life, and walk like you mean it. There's no complicated process associated with weighted walking, but there are a few programming parameters to consider. Reasoning is also a must. Let's examine why you should do loaded carries before digging into how to program them. I work mostly with football and rugby players, so building stronger traps is a matter of function for their given sports. As a coach, I made building yokes on high school and college players a point of pride. Before training the upper traps, it's important to understand their muscle fiber composition. They're predominantly slow-twitch muscles, so making them grow is often the product of a lot of time under tension (TUT), accomplished by holding something heavy and taking a walk with it or large work volumes. The growth of the service industry marked the death of grip strength. Rather than hauling bricks and slinging nails, men are cornered in cubicle confines typing reports and organizing spreadsheets. As grip slips, carpal tunnel syndrome holds strong. Grip strength, though, is crucial for every lifter and athlete—even physique athletes. The more weight the hands can grasp, the larger the muscles can grow. A strong grip also starts the process of irradiation, which is the recruitment of adjacent muscles throughout the body. This process sends signals to the brain that it's OK to let loose and produce savage amounts of force. Farmer's walks build balanced strength and stability in the shoulder girdle. As you walk with something heavy, the shoulder blade aligns where it should be and the supporting musculature is recruited, thereby improving posture and shoulder function. Bill Kazmaier, possibly one of the strongest men who ever lived, has a great quote: "Strong back, strong man." I couldn't agree more, especially when we think of the back as it functions with the core. The lats comprise a large portion of the back musculature and are important core muscles. Playing a dynamic strength and core stability role alongside the lats are the abs (rectus abdominus and obliques), spinal erectors, quadratus lumborum, and glutes. Loaded carries, especially unilateral variations, demand massive core muscles to grind and protect the spine. Carry consistently and you'll earn a strong back on your way to becoming a strong man. The basic loaded carry is simple: Pick up a heavy object with one or both hands, hold it, and walk for distance or time. Even so, there are a variety of loaded carry variations. These are some of the most popular. Grab a heavy weight in each hand—such as a dumbbell, kettlebell, or farmer's walk handle—get tall, and walk. Same as above, except performed with only one hand. Hold two kettlebells or dumbbells in the rack position. Walk. Same as above, but performed with only one arm. Hold one kettlebell or dumbbell in the rack position, and hold another in the traditional farmer's walk position at your side. Don't be afraid to use a heavier weight in the down hand. 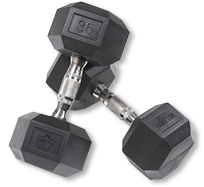 Hold a dumbbell or kettlebell overhead with the elbow locked, like a waiter carrying a food tray. There are two simple ways to program carries—time and distance. Lighter weight works best to build grip strength and should be programmed by increasing the time under tension. Heavy weights are best programmed to meet a certain distance with single sets or by meeting a total distance added up during subsequent sets. It all depends on where you place loaded carries in your training sessions. You can also warm up before a workout with loaded carries. You need enough weight to make the carry worthwhile, but not so much that it's taxing. The goal is grip strength and shoulder muscle activation. My high school football players, depending on strength, use 40-60 pounds and do a few 30-second carries. Carries also work well in a superset paired with another exercise, or as a standalone exercise mid-workout. In either case, time or distance carries work. Just make sure that your exercise pairings make sense. Don't superset heavy deadlifts with farmer's walks. Upper body pressing variations work well with carries. My favorite combo is incline bench with farmer's walks. I also like to use heavy carries as a finisher and walk for distance. Finishers are a time for building intestinal fortitude. There's nothing like hauling heavy weight to end a training session. Which of the 6 Weighted Carries Is Your Favorite? Tell Us Why in the Comments. For years, I thought pinning the shoulder blades back and down for loaded carries was correct. I was wrong. While performing the variations described above, make your spine as long as possible, grab the weight with fierce intent, and let your shoulder blade settle naturally. Visualize a string attached to the top of your head and another to your sacrum. Pull each of these strings in your mind and stand tall. Your posture will instantly improve. Hold this position while breathing low into your belly. When doing farmer's walks with lumberjack-approved weight, keep the weight slightly off-center in your hand so it's marginally polarized toward the front of your hand. This keeps the predominance of the stress on your first three fingers—the strongest ones for grip. The last thing a lifter needs is pinky failure halfway through a heavy walk. Training seems complicated, but it doesn't have to be. A strong grip, healthy shoulders, and massive traps are yours by simply picking up something heavy and taking a stroll.